This game is used to compare numbers in Math. It comes with a set of 54 dominoes to print and a domino recording sheet with directions. Game Play Option #1: Work with a partner. Take turns. Roll 2 dice. 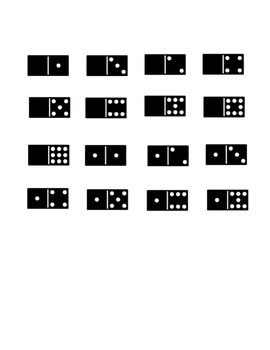 Draw the dots on either side of the 1st domino. Your partner rolls 2 dice. 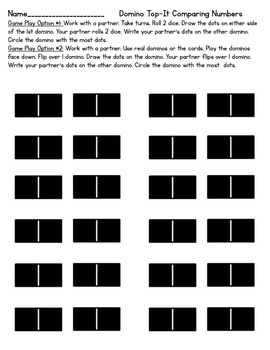 Write your partner’s dots on the other domino. Circle the domino with the most dots. Game Play Option #2: Work with a partner. Use real dominos or the cards. Play the dominos face down. Flip over 1 domino. Draw the dots on the domino. Your partner flips over 1 domino. Write your partner’s dots on the other domino. Circle the domino with the most dots.